Thanks JT. I saw those last night, they look like the ones. Nice! Post some pics up when you get your interior all together. One thing I've noticed is that none of the "NOS" fabric matches the factory fabric AT ALL. Not just the color, but the actual fabric is a different type. I'm trying to see if some other automotive fabric is a better match for the bolsters than the "NOS" stuff available. I'll post if I find something interesting. Hmm thats interesting. I never ran into that since i never went out with the intention of making mine factory correct (obviously lol). I copied the factory pattern exactly but did not use NOS fabric on the bolsters or the door panels. I just used the darkest black velour stuff i could find. Okay, some observations: Now that I have my full LS Conteur interior (ie, front seats, back seats and door panels), and have contacted everyone on the planet about fabric, NONE of the "NOS reproduction" stuff is even close. And everyone uses the same reproduction stuff. As I stated earlier, the repro bolster material is not only much darker, it is a COMPLETELY different fabric - it doesn't matter where you get it from. The CAMARO inserts are off as well. I took the plunge and ordered some CAMARO Spectrum fabric from a TGO member. The factory fabric has a bluish/silver panel followed by a medium blue/gray panel followed by a dark blue panel. The repro stuff has medium blue followed by a kind of royal blue and then a dark blue. Looks nice, but hardly "NOS". So, what am I going to do now? I'm going to redo as LITTLE as possible on my interior. I'm going to use some of the CAMARO spectrum stuff on my driver's seat and just leave the other seats as is, after I touch up some small spots with paint and fix some cigarette burns that is. I'm taking a rear seat cushion to the fabric store to see if I can match the bolster fabric. If that doesn't work, I'll cut a sliver of the bolster fabric and send a sample to Original Auto Interiors for a match. Last edited by chazman; 05-09-2010 at 11:47 AM. Original auto should be able to help you out with the bolster fabric. If not SMS i believe can get it as well (at least the burnt orange they have). As for the NOS fabric that seems to be the case across the board. I know that mine is suppose to be the burnt orange and ends up falling somewhere between the red and the burnt orange. For my interior i didnt care but if your going for concourse perfect then i can see how this would bother you. As for only doing the driver seat..be prepared for it to look a bit "off". If it was my car it would be all or none. Once you start piecemealing it, its going to look a bit odd and someone will be able to see that you've fixed the drivers seat and only the drivers seat. If that doesnt bother you then by all means but i would either give in and use the darker stuff since it seems to be the only stuff out there...or keep your eyes open for another blue interior in better shape. Yeah, I need to make some kind of decision here. I've got these seats set up in my garage and I keep moving the Spectrum fabric from the driver's to the passenger's seat and back again. Pretty sure I'd need to do both fronts with it. We'll see. BTW, those seat belt guides on the '83 Conteur seats are apparently identical to the '78-'81 F-car seatbelt guides. I'm not entirely sure that this is correct. I purchased my cloth several years before this the new reproduction material was available and for sure the fabric is darker in all respects, but the "camaro" is spot on. The "GM" insignia as well as the part number is printed on the reverse side. I'm positive that what I have is truley NOS. Why is it darker? I dont know. Chazman, these are the rear seats I was discussing awhile back. I sent you a PM. I really like the black 85 only interior . Looks good! Just in case you guys didnt see it. A set of red ones for sale in the classifieds section. What are these interiors worth now? Seats, door panels....good condition. Worth whatever someone will pay for them. There is not a huge market for them and they are a love it or hate it kind of thing with no real in between. If i had to throw out a number id say 300-400 in GOOD condition. Ive seen others asking way more but they dont sell. What color are we talking about too? You have an 83 so im going to assume you have the burnt orange one? I agree with Subroc, you would be doing good to get anything more than $400.00 for the complete interior as I have rarely seen one of these interiors not need reupholstery. I bought an entire car just to get the seats out of it two months ago off of the Atlanta Craigslist for $500 and I resold the car in a day for $450. The interior was in great shape, I would say excellent "driver" quality. I picked up a set of there yesterday. Only the two front seats, but I only paid $100. They are in virtually PERFECT condition, once I clean them and scotch-guard they should look mint. Only defect is on the driver's seat, if you pull the leg thing forward there's a small 1cm hole. They are the black/charcoal color so from 85 I guess. Only weird thing is that for the drivers seat, the lever to slide the seat forward and back is on the right side...I would think it would be impossible to get to when installed because of the center console...that being said, I'll just install it to the regular track I have now with the lever in the front. I need to find rear seats though. I'd like matching split-back ones, but if anyone has any black split-back seats let me know. I'm also looking for everything I need to make the front seats power. I AFAIK, the driver's side was the only one offered with power so I'd have to rig the pass side. I'd need the tracks, switch, and the plastic trim for the switch (preferably with the velvet on it because that's what the seats have now. Oh, and if anyone has one of the passenger side conteur seats let me know because I could easily take the upholstery from the one I have now and put it on one from a trans am. Or if you have the '86 Conteur or any factory Recaro seats let me know. Last edited by claytonjn; 12-20-2010 at 12:00 PM. Not sure what you mean about the cloth attaching different though between pass and drivers side in the camaro, to me they look exactly the same except that the bolsters on the conteur seat are a little thicker. And the lumbar support for the legs of course..
Yea, I know pass power seats weren't an option on third gens, but I thought I had read about someone who had gotten drivers tracks installed for a pass third gen seat. Could be wrong though. Pass side isn't a big deal anyways. I understand what you're saying about the seats, I'll keep my eyes open for more of these Conteur seats. 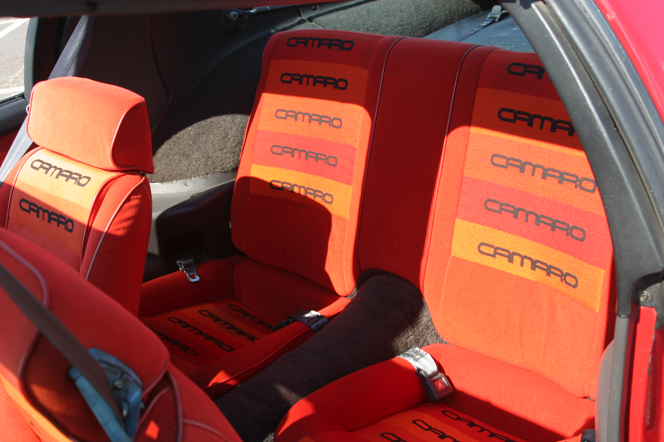 What can you say about trans am with Lear Siegler conteur seats? 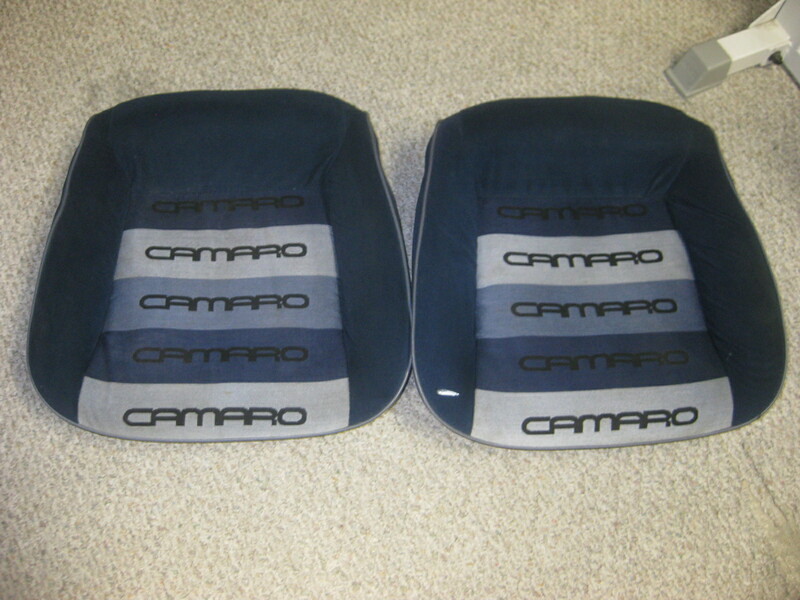 They were like the Camaro seats, except both sides were fully adjustable and they had a pocket on the backs of the seats. In '85, they got a different headrest that was not shaped like the Camaro seat's headrests. Check my vbGarage (icon next to my online status) for a pic, if you wish. 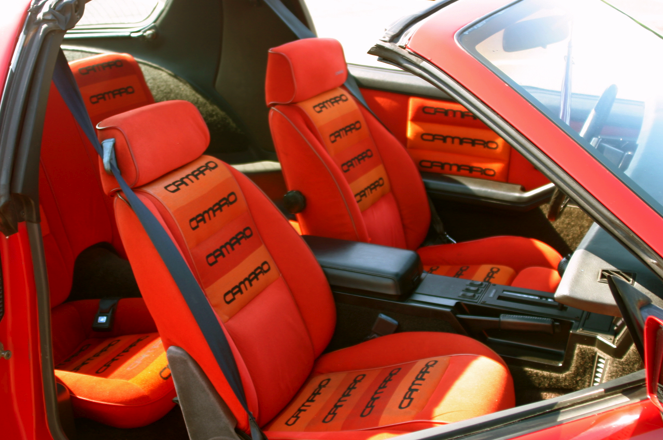 Is there any information as to how many 82 camaros came with the conteur seating ? 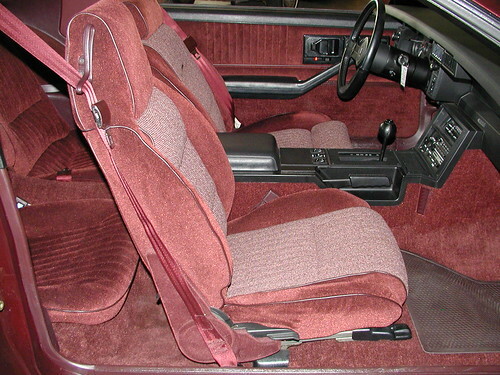 This is the exact interior I have in my 1982 Z28, have never seen an exact color and option match before, same exterior too, BEAUTIFUL, thanks for posting these images. Can't be that many with this option, I know the Maroon color is on 9889 bodies out of a total of approx 189,747 built in 1982, that's a pretty low number and makes this color somewhat rare for this production year. I am in the process of restoring my Z and was almost convinced to do a color change to charcoal in the interior but now after seeing yours I have changed my mind, keeping her original, kinda forgot how nice it looks. Last edited by jfl1960; 04-11-2011 at 08:40 PM. Okay I am going to throw in some new information that I have been researching on these special seats, and that there are two different adjustable "thigh supports" used in 1984 models. The second design is larger than the early design that had been used since 1982. This second design also carried over into the 1985 seat design and wasn't changed again until the new seat came out in the 86 models. What is not known is the exact time this change occured in the Camaro, Firebird, and Sunbird models. I figure it may be as early as January 1984 as that is when it first appears in the GN's and T-type Regals. I have all 3 style seats, a few Camaro and a few Firebird. I have only seen the first thigh bolster design on the 82-83 Camaro drivers seat and Firebird seats. I have only seen the second design thigh support on a Camaro seat from 84-85. That's what I know,..... Hope it helps. Ive seen the second design support on an 85 trans am...which supports Johns info about it being a 84-85 design. I have to correct myself - sort of ! Year range does appear to be 82-to-83, 84-to-85, & 86. Yesterday I wrote that I have never seen the second design on a Firebird seat - I was wrong. Previously; all the Firebird Conteur seats I bought were bought as seats. ( and all were the first design ) But; a couple years ago I bought an 84 Trans Am parts car and it had factory conteurs in it. I just put my eyes on those seats and they have the second design thigh bolster. 1982 - mid 1984 use the 1st design. 1986 one year only seat that was completely redesigned with no parts interchanging with the previous design other than headrests. ***I do not consider it a 3rd design since the entire seat was redesigned. 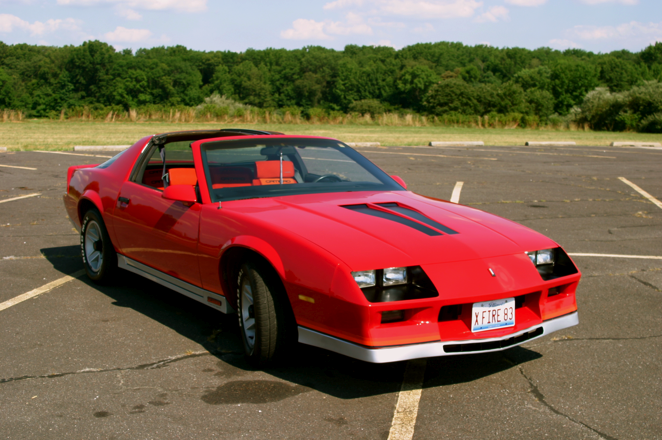 does anybody here know how much one of these camaros would go for if it had the original seats and was a true lear siegler car but needed a complete restoration? Last edited by Rat Pack; 06-23-2011 at 09:29 AM. 1. 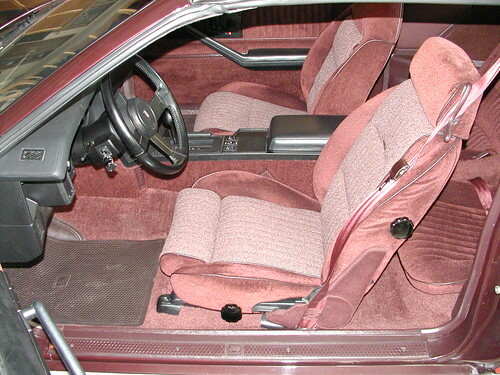 My Camaro is a 1982 Z28 with this seat option, it only has a driver seat with adjustable bolsters, was this the common practice or was there a passenger side Conteur seat offered in 1982? 1. In Camaros, driver's seat only. 2. The following is 83-86. I've not seen covers that will fit an 82. Last edited by JamesC; 06-23-2011 at 11:31 AM. How is the quality/accuracy of the hawk conteur sets? Was the brown ls interior '85 only for the camaro's? And are there any other differences between the 85 and the rest? I have a set of seats and door panels (brown) that just came in on a mint body right now... What's throwing me off is that (and I posted this on another section the other day) My driver's seat doesn't have the adjustable "thigh area". I was told that the driver's seat wasnt correct, However, we had a guy come by earlier thats a pretty big collector and he swears up and down that they're not only correct, but in virtually perfect condtion, sans a little dirt and a tiny tear on 1 of the seats. I've been trying to research it myself, but everywhere I've looked seems to conflict with the last. Can you post a pic of your seats? Its the color thats really throwing me off. Are your headrests tan, or are they a reddish brown? From what i've seen (and ya'll feel free to correct me if I'm wrong) The conteur seats (which is the one with the thigh rest) are on all drivers but not all passengers? And I've seen 2 different shades of brown... (Mine are light tan on the headrests, sides of the seat.. others seem to be a reddish-brown) Any input on the reason for the color differences? Last edited by Rat Pack; 03-06-2012 at 10:24 AM. Yup everything is in the first page of this thread. Saddle was a really nice color but for some reason one of the rarer ones to find. Saddle interior on a yellow gold iroc.....wheres the damn drooling smily when u need it. I took a look at your seats, I never really paid that much attention to these seats execpt for the fact that mine were original and don't match. I see the passenger side seat was redesigned in the 83 and newer, the 82 didn't have an adjustable headrest, just the hi-rise bucket, also the driver's seat appears to have gotten some extrat support built into the adjustable bolsters, the Camaro_Camaro_Camaro logo is a bit much for me but hey it was built in the 80"s and did get the nickname the "Disco Camaro". 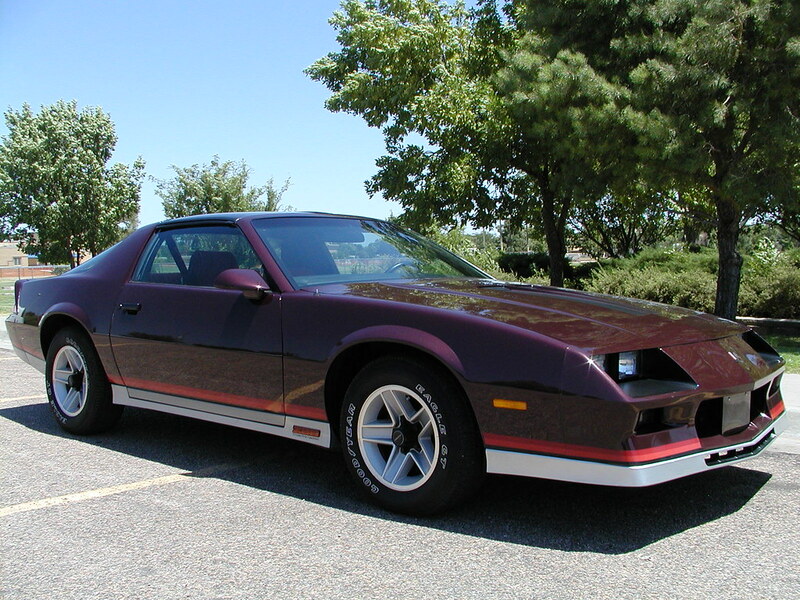 Anyway I am assuming an original 1982 Camaro Z28 Conteur seat option car is pretty rare these days. Thanks for the info guys very interesting. i thought 83 was the first year for the camrao camaro camaro seats but anyways having an original ls car is only rare depending on the condition of your seats i recently priced how to recover the seats and it was 800 dollars so any benefit to having an ls camaro is taken away if the seats are not there or in bad condition..thats why its are job as owners to restore these cars to the former glory or find someone who will!